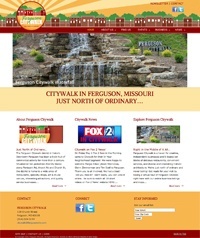 We were excited to redesign this website for Ferguson Citywalk – the historic downtown district for Ferguson, Missouri. The template design for this site is bright and cheerful, based on the fun Citywalk logo. A large front page slider advertises upcoming events and points of interest in the Citywalk area. Searchable business and available property listings feature large Google maps with clickable location markers for each business. Each business has its own detail page with description, image and map.